I saw Dr. Cantieri right away. We chatted about my new tattoo, decided it was a “needle week” for me, and I told him the tattoo pain was a piece of cake compared to prolo pain. As I went on to tell him about the last few months, I kept referring to my neck, jaw, and shoulder-blade areas as my most painful areas. I also told him I felt I had gone about 3 weeks too long in between treatments. 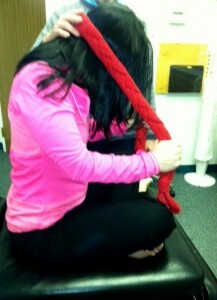 Dr. Cantieri asked if I was doing isometric neck exercises as part of my home rehab program. After I told him no, he went and got a towel and we went through a set so I would know what to do once I returned home. I was pretty excited to get more neck exercises, since I often feel like if I can keep my neck and shoulder-blade muscles firing, then I get fewer headaches and my head doesn’t feel like it’s going to fall off (or in other words I won’t need my hand or a neck brace to hold my head up). 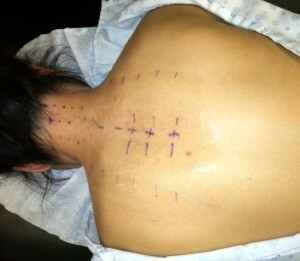 After the neck exercises, Dr. Cantieri started with his own gentle OMM; especially in my lower rib area. 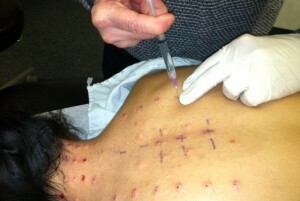 Then it was time to map out the areas I needed prolo’d, followed by the actual injections. Because it was a 8:15 appointment, I had not eaten breakfast before. That was a mistake. I ended up with a “rainbows and unicorns” type of lidocaine buzz and I got really shaky. However, I will say that drinking a little Juicy Juice with my feet elevated went a long way for making me feel like I could sit up without passing out. The only pictures I didn’t get were jaw injection pictures when I was laying on my back, with the injections going into my cheeks. Those made for a quieter Katie the rest of the day, which is really, really strange for everyone. 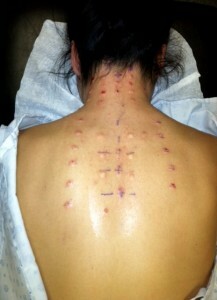 Anyways, I felt like I had to have more injections than the last few times because I went too long in between. 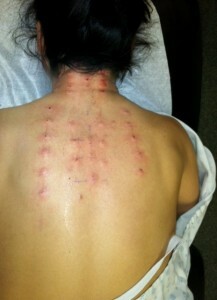 My body was definitely craving this stabilizing “tune-up.” Next time, I know I will need to get back to Mishawaka sooner. Overall, it was a pretty uneventful trip. We were home by noon. I was on my heating pad by 12:15. I only puked a couple of times. Today, I have still been taking it pretty slow but by Monday I should be as good as new. Why do I do it? Because I have dodged major surgeries and heavy pain meds so far. That to me is worth the money, worth the travel, worth the pain.